Let’s face it; you get paid by what you can fix. To fix a car it's important to have the right tools for the job. Before you buy a tool, first ask yourself if it’s both full-featured and easy to use. Coverage, coverage, coverage. With AutoEnginuity®'s Giotto™ ScanTool, coverage is our most important feature. We offer professional-grade enhanced coverage options for 58 carmakers. It’s not just the breadth of coverage that’s important—it’s also the depth of coverage. With our enhanced expansions you can have access to ABS, airbag, enhanced powertrain, instrument cluster, transmission, and dozens of other body and chassis controllers. The depth of coverage consists of live data, bi-directional controls, adaptive resets and learns, system tests, and trouble code retrieval and clearing. 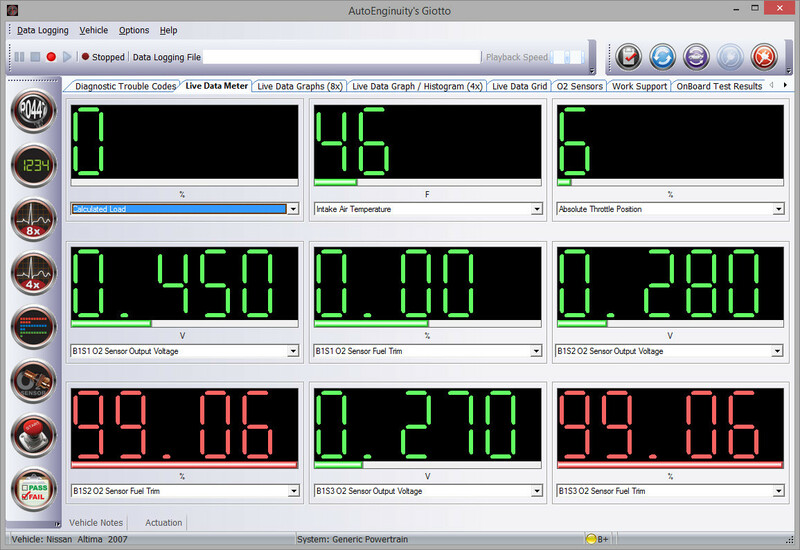 AutoEnginuity® pioneered the art of powerful user-interfaces while never sacrificing the ease-of-use. Our industry-leading graphing can pan, zoom, and display several plots on the same graph with a single click; more advanced graphing features includes tagging plot locations for quick identification and printing the graph. Print DTC and IM/Mode 6 data in a customizable report format. Use those reports to walk customers through necessary repairs and upsell optional repairs. Translated and scaled Mode 6 data. View data in a useable form instead of raw data. Data logging in two different formats: 1) XML for browsers; and 2) CSV for spread sheets. Whether you logged in XML or CSV, you have the ability to playback and view your logs offline. Configurable Sensor data. Each individual sensor's sampling rate, ranges, alertable audio trigger points, units, and scaling value can be set to your specific needs. 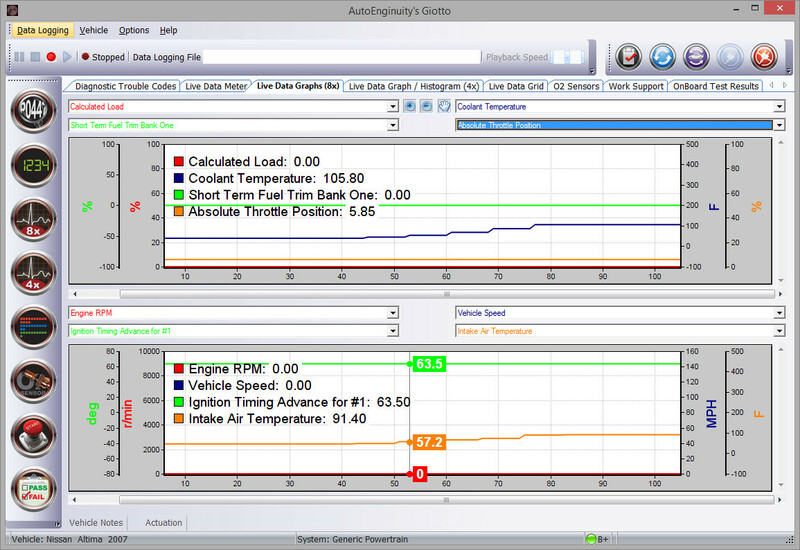 WithAutoEnginuity®'s Giotto™ ScanTool you can have both a full-featured scan tool and professional-grade coverage. Today, everybody understands the power of personal computers and their versatile interface. Why not leverage the technology already at your fingertips for your scan tool? The familiar Windows® interface provides access to systems and sensors more intuitively and more quickly than traditional handhelds. Want to add all of the sensors for a system? 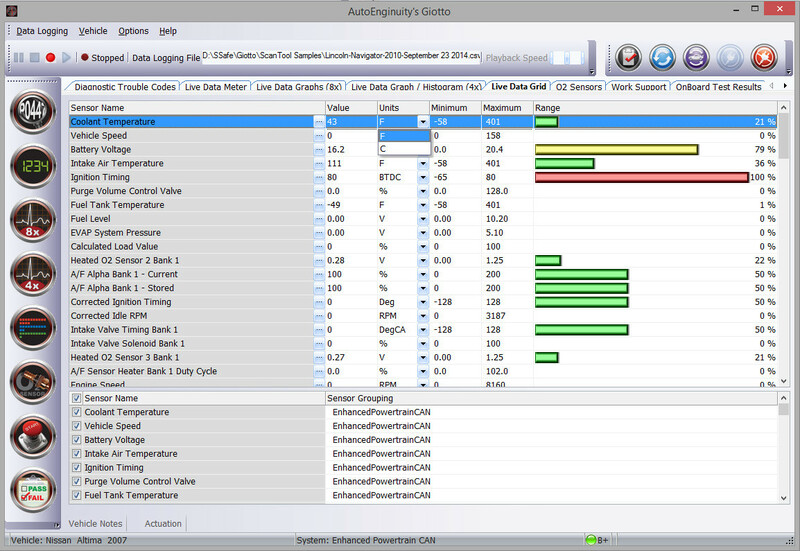 Simply navigate to the live data screen and click the column header for sensors. It’s that easy. Complex tools do not require complex user-interfaces. Lastly, ease-of-use also extends to the software being customizable. You can arrange the user-interface to suit you and even your computing device. Even if you purchase a new high-resolution laptop, you can set the software to use the higher-resolution user-interface. Efficiency with your tool translates into more vehicles you can repair. With AutoEnginuity®'s Giotto™ ScanTool, you can focus on what's important—servicing the vehicle. With our Coverage On Demand™ feature, you can buy the coverage in bundles or à la carte. It’s totally up you, and your needs. For example, if your customer brings a Jaguar in and you have the AutoEnginuity® Asian bundle, simply call AutoEnginuity® sales and we can add Jaguar within that hour. You can then bill your customer for the diagnostic time and proceed with the repair. Now you can save money instead of farming the work out; and, in some cases, save time not shipping the vehicle out. The automotive industry is fast moving and ever changing. With AutoEnginuity®'s Giotto™ ScanTool you can stay on top of the latest coverage you need. Our ScanTool is updated frequently through the Internet. The base ScanTool software updates are free. It's important to have the right tools for the job. Don't waste your time with tools that lack the coverage you need. 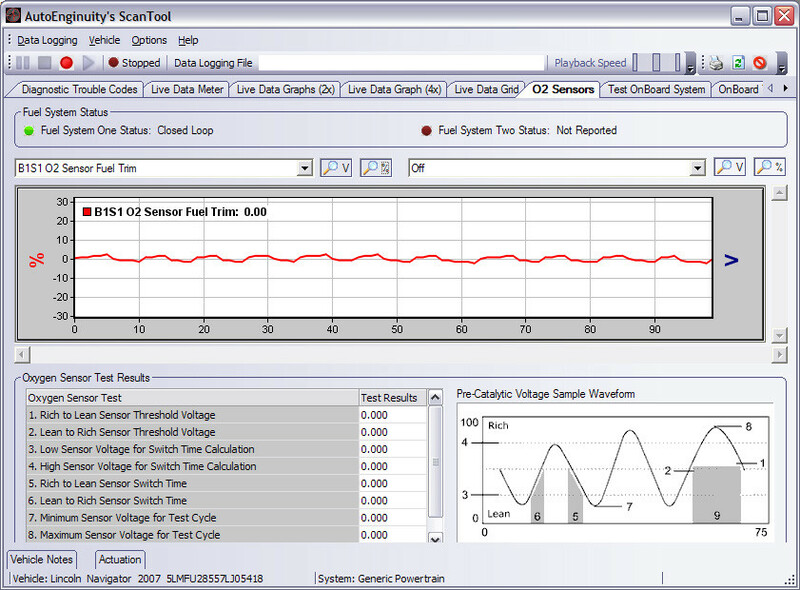 With AutoEnginuity®'s Giotto™ ScanTool you will have a powerful full-featured diagnostic tool that can grow with you and your needs. 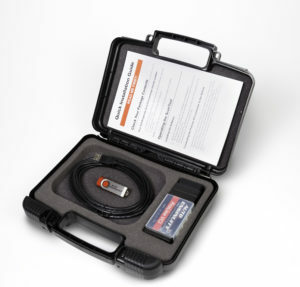 Buy the one tool that will help you diagnose all of your ‘96 and later vehicle’s needs. Invest in your future, buy AutoEnginuity®'s ScanTool today. 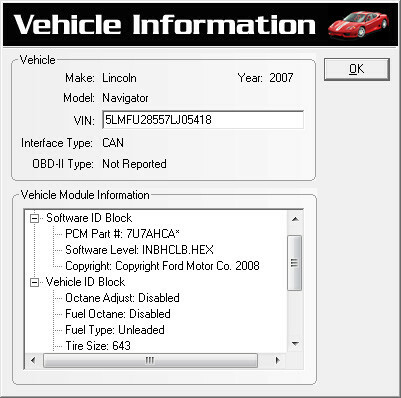 Unlimited logging of live vehicle sensors in XML or CSV (1ms logging accuracy). Playback your data logs for offline analysis. Read the ECM ID, calibration, and calibration verification IDs from all reporting ECMs. Supports: 1996 and newer passenger vehicles whether it be domestic, Asian, or European. 1USB 2.0 support is required for operation. USB 2.0 is built-into Windows® XP (not supported) and later.